Oh snap! Carey denies that she and Eminem dated, but Eminem has a different story. In "Bagpipes From Baghdad" the rapper warns Nick Cannon, "I want her back, you punk." On Carey's latest track "Obsessed," she sings, "Why are you so obsessed with me... Lying that you're sexing me/ When everybody knows/ It's clear that you're upset with me." The Eminem/Mariah Carey/Nick Cannon feud is heating up. In a new song called "The Warning," the rapper calls Mariah and her husband, "America's Got Talent" host Nick Cannon, a slew of profanities and claims to have "pictures" of the singer. "You probably think since it's been so long, if I had something on you I woulda did it by now," he raps on the leaked track, adding he has "enough dirt on you to murder you." CLICK HEREto hear the song. 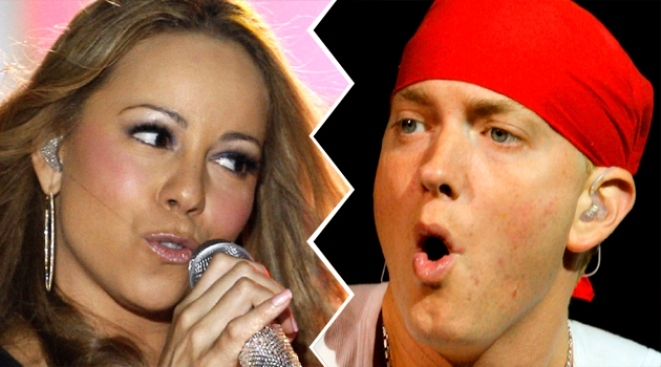 Eminem also claims in the song to have slept with Mariah "once" and criticizes her "alcoholic mind." Previously, Eminem ignited the feud by calling out Mariah and Nick in the song "Bagpipes from Baghdad" off his new album, "Relapse." In the track, he suggested the couple should break up and said he wanted another shot at Mariah. Nick responded with a blog post in May where he called Eminem "Slim Lamey," and said he wanted to meet up with the rapper to "deal with this like adults." Nick also claimed Eminem never got to "second base" with his wife. Mariah herself seemed to respond with her video for single "Obsessed" in July, in which she depressed up in Eminem-style drag – which Eminem addresses in "The Warning," but Mariah's camp denies was an impersonation of the rapper – and sang the chorus, "Why you so obsessed with me/lyin' that you're sexin' me." Reps for Eminem, Mariah and Nick were not immediately available for comment, though Nick offered a competitive statement on his Twitter on Friday. "This ain't checkers. This is chess!" he Tweeted.